﻿ Suwannee Valley Transit, More Meeting Issues Nash Steps Up, "If It's Not Legal – We'll Cancel It"
Suwannee Valley Transit, More Meeting Issues Nash Steps Up, "If It's Not Legal – We'll Cancel It"
COLUMBIA COUNTY, FL – The Suwannee Valley Transit Authority has been problematic for years. A tri-county special district (Columbia, Hamilton, Suwannee), the SVTA is administered by Suwannee County Commissioner Larry Sessions. The SVTA is overseen by the FDOT's Commission for the Transportation Disadvantaged and its Director, Steve Holmes. History has demonstrated that Commissioner/Administrator Sessions selectively pays attention to Florida's Sunshine and Public Record laws. When Mr. Sessions and the SVTA board scheduled a special meeting for Monday, March 6, Mr. Sessions again ignored the requirements of the Uniform Special District Accountability Act, (Special District Handbook) which makes it mandatory that the SVTA post its agenda and back-up material to the SVTA website 7 days before the meeting. It didn't. As reported yesterday, Columbia Cnty Comm'rs Nash & Phillips: 2 Who Turn Their Backs on Columbia Cnty Residents, the SVTA scheduled its Monday meeting in conflict with the Lake City, City Council meeting. Your reporter: "Mr. Chairman it's nice to see you tonight. 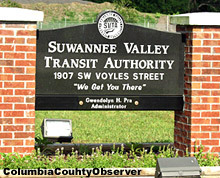 Suwannee Valley Transit – that seems to be an issue once again -- with their illegal meetings. Section 199.069 [189.069] of the Florida statutes makes certain requirements of Suwannee Valley Transit, which they've again, ignored. It says that they have to post their stuff on the Internet and one of the things that they have to post, at least seven days before each meeting or workshop, is their agenda and they didn't do it, again." The Observer continued, "... I would ask the County Attorney [Joel Foreman] to comment on this. ... It's an illegal meeting. It says they shall do it. There is no question about it. And you guys have missed the boat before. This is nothing new with Suwannee Valley Transit." 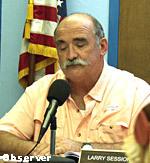 "I hope Mr. Foreman has a chance to address the SVTA issue and their illegal meeting scheduled for Monday night. Thank you very much Mr. Chairman." County Attorney Foreman addressed The 5, "I can address this briefly. This was brought to my attention. Chapter 189, Uniform Special District Accountability Act ... [there is] a seven day requirement for agenda materials. To the extent this board has members who sit on that board, certainly I'd be willing to discuss with those folks how this might be important to them and what they might want to discuss with Mr. Airth with respect to the SVTA." Your reporter inquired, "Is this meeting legal or not legal? It hasn't been posted. That's my question." County Attorney Foreman responded, "I said the statue has a seven day internet posting requirement." Your reporter followed up, "And the stuff not's there." Mr. Foreman: "I don't know." Your reporter, "Well, anybody can look. I'm telling you it's not there." "Don't Argue. He don't know." 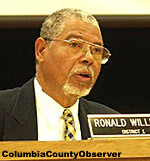 Chairman Williams said, "Don't argue with him, he said that he don't know. He gave you the stature." Your reporter inquired again, "I'm telling you it's not there right now, so if it's not there, is that a legal meeting? Chairman Williams said, "Mr. Lilker, you need to talk to the Suwannee Valley Transit." Your reporter said, "No, I need to talk to the County Attorney, because these two guys are involved. [Commissioners Nash and Phillips] It's not posted on the Internet. I checked today. Anybody can show you right now." Chairman Williams followed up, "Wait one minute. We gave you the stature and what the stature said. If you got a problem with somethin', you need to speak with the attorney from Suwannee Valley Transit, and not Mr. Foreman, because Mr. Foreman do not represent Suwannee Valley Transit." Your reporter said, "But he represents this Board." Chairman Williams said, "That don't have anything -- Suwannee Valley Transit have their own attorney, right?" County Attorney Foreman answered Chairman Williams, "They do, Commissioner. My concern would be our Board members who participate with that board. I would – you know – again advise them to either ask me about this, or speak with Mr. Airth. I understand Mr. Airth represents the SVTA, but the Uniform Special District Accountability Act is real and it does have specific requirements. I would want to make sure that our board members who are participating with SVTA understand what those requirements are." Commissioner Nash, one of the two County's SVTA board members said, "OK. Joel, if you will, I'll call Larry Sessions in the morning and get you with Mr. Airth. If it's an illegal meeting, we'll cancel it." After the meeting, your reporter spoke with County Attorney Foreman, looking for an explanation regarding why he wouldn't just say the meeting was illegal. Your reporter concluded the conversation, "Maybe you could email something so there will be no confusion." 1. At the time I was making my statements about Ch. 189's 7-day online posting requirement for SVTA agendas and materials, I believed the Commissioners on the SVTA Board would understand that if the agenda and meeting materials were not posted, then the meeting would be illegal. 2. In retrospect, I should have been clearer with my statements. Therefore, tomorrow I will be sending a memo as well as personally contacting Commissioner Nash and Commissioner Phillips to advise them against participating in any SVTA meeting not set and noticed in compliance with Chapter 189. While it appears that the March 6 special SVTA meeting will be rescheduled, clients don't always listen to their attorneys, the issue of changing the concurrent scheduling of SVTA meetings and regularly scheduled meetings in Columbia County remains unsolved. How that gets resolved is clearly a matter for the County 5. If The 5 agrees with Commissioners Nash and Phillips's "I don't go to those meetings," then at least they would have done what they get paid to do, "Make a decision." Columbia County, FL: the legend continues.